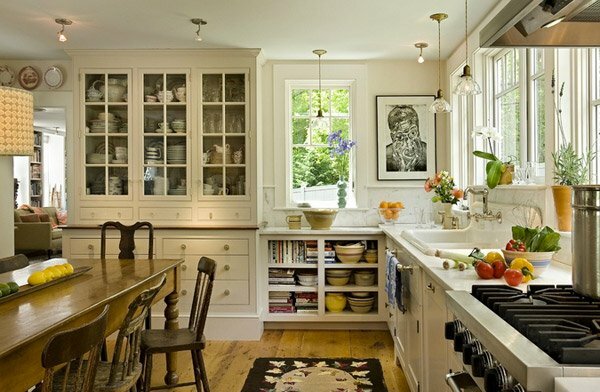 Whenever we say Farmhouse kitchen, we always imagine that cast-iron sink with the double drain boards, the pine-topped island, and open shelving. We usually see the 1920 sinks which everyone loved because of the unique beauty it gives to the kitchen. We also have that salvaged rug which we can cut down and rebound into a chichi kitchen mat. We’re sure that there are more to what a Farmhouse kitchen can actually offer – but we prefer you’d see them for yourself. 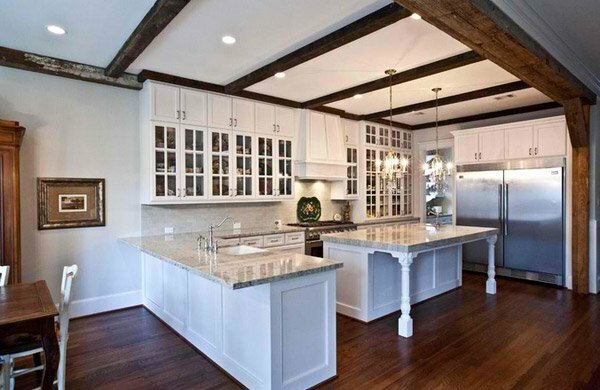 Today, we will be showing you 15 Traditional and White Farmhouse Kitchen Designs, which will nostalgically invite you into a different realm of how one’s kitchen can a difference in the design and feel on one’s home. We want you to enjoy how one shabby space turn into the kitchen we have always dreamed of – homey, comfy, definitely functional, and stunning – without that much of the usual cost you’ll have to spend to have that dream kitchen. Take a look below. This kitchen was formerly a dark paneled, cluttered, divided space with little natural light. 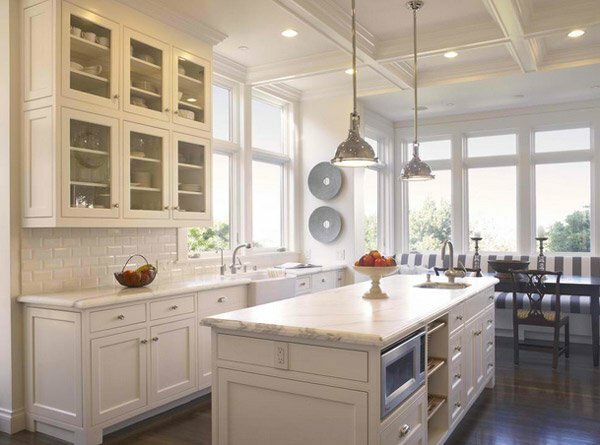 Simple, yet sophisticated, Carrara marble countertops and subway tiles put the spotlight on the unique collections. Built-in wall nooks and glass-door cabinetry provide ample room for storing treasured objects. 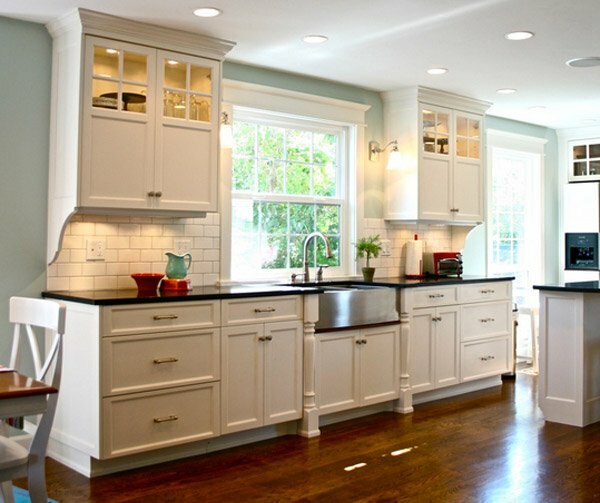 Looking at this kitchen, we can say that these are some of the prettiest cabinets we have ever seen. This home in Salt Lake City is sure stunning. 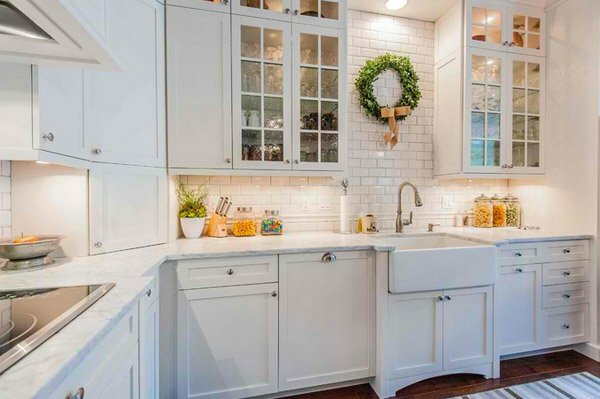 A boxwood wreath adds a merry touch to an all-white kitchen in Orlando, Florida. Polished nickel plumbing, hardware and custom grilles on feature cabinets along with the island pendants add shine, while finer details such as inset doors, furniture kicks on non-working areas and lofty crown details add a layering effect in the millwork. 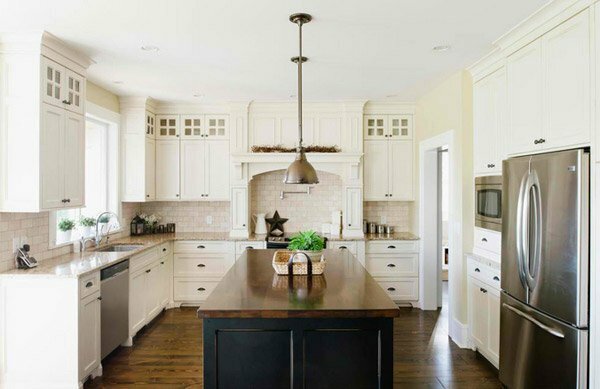 The kitchen in itself is pretty, but note that those lobay style pendant lights are just as gorgeous. Their highly reflective holophane shades and industrial mounting makes them a very popular style. 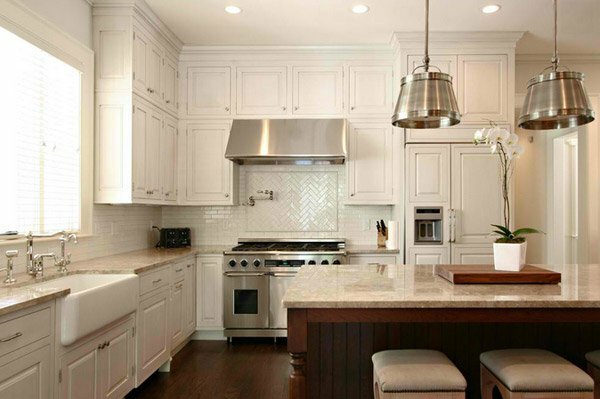 The cabinet color is called Antique White which complement well with the center island and the flooring. They seem like a perfect partner for each other. A recent kitchen and master bath renovation completed by John Kraemer & Sons. Located in St. Paul, MN. We can say that is one glamorous renovation. We can live here! 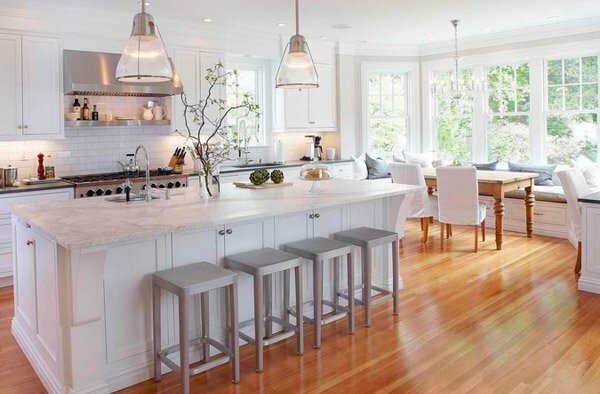 Another example with big over-island lighting, this spacious kitchen combines several design styles. Wide-plank floors, cane bar stools and Calacatta countertops blend contemporary, traditional and modern elements together seamlessly. Although this style tends to be one of the most expensive on the market, it’s a classic look that’ll last for generations. The inset door gets its name because it is set inside of the cabinet frame – typical cabinet doors rest on the outside of the frame. Kitchen remodel with white inset cabinets by Crystal on the perimeter and custom color on custom island cabinets. 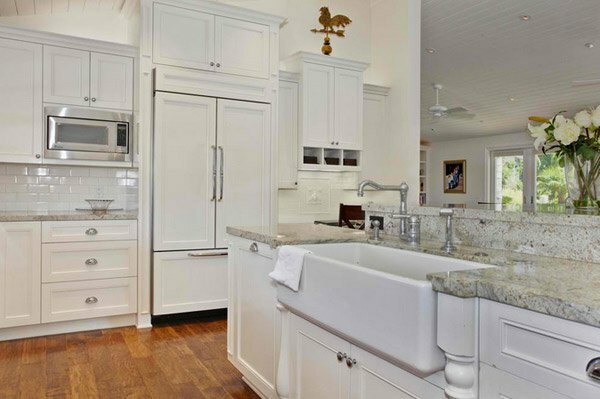 Perimeter cabinets feature White Princess granite and the Island has Labrodite Jade stone with a custom edge. Kashmire White granite, bright or true white cabinets, silver hardware, stainless appliances, plank ceiling, white ceiling fans. Farmhouse look. 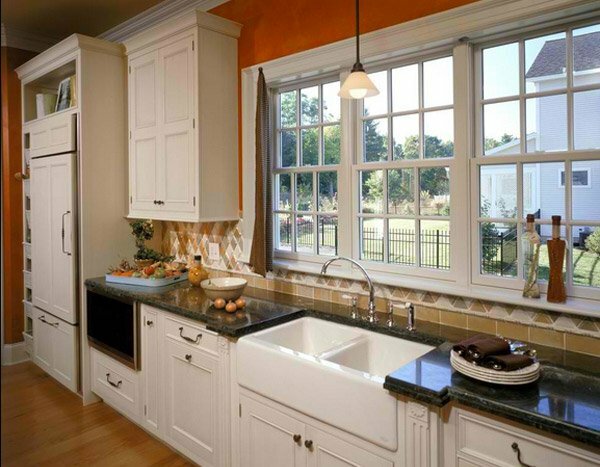 This kitchen space is a good representation of your counter top space. Great color combination and stunning view by the window. 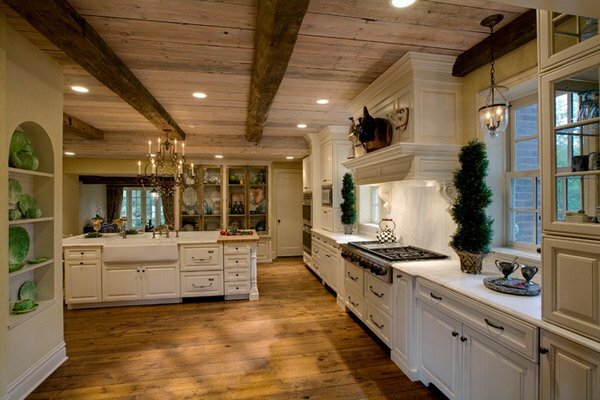 The first thing people notice about my kitchen is the gorgeous reclaimed beams on the ceiling. 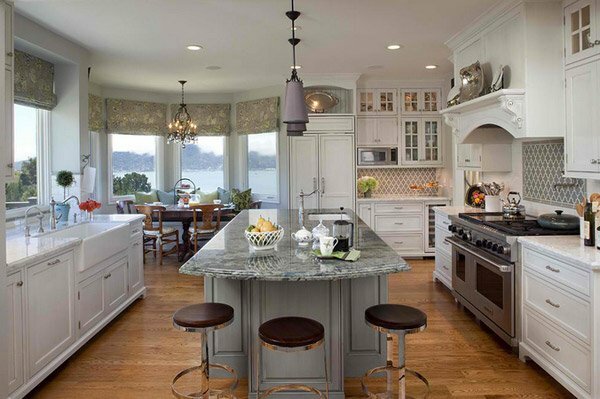 Note the stunning the cabinets, counters and the island – just spectacular. We can sum up that the 15 Traditional and White Farmhouse Kitchen Designs are all beautiful and functional – two things we want our kitchen to be! There may be times that one space can be beautiful but not really functional or vice versa; but according to the list we have just shown you, it is pretty much possible to combine this two things together to create one stunning masterpiece – your very own Farmhouse kitchen. If you’re interested, you can also check the 16 Stunning Kitchen Storage Ideas for other references when it comes to storage solutions! Have You Seen a Kitchen That Connects From Inside To Outside?